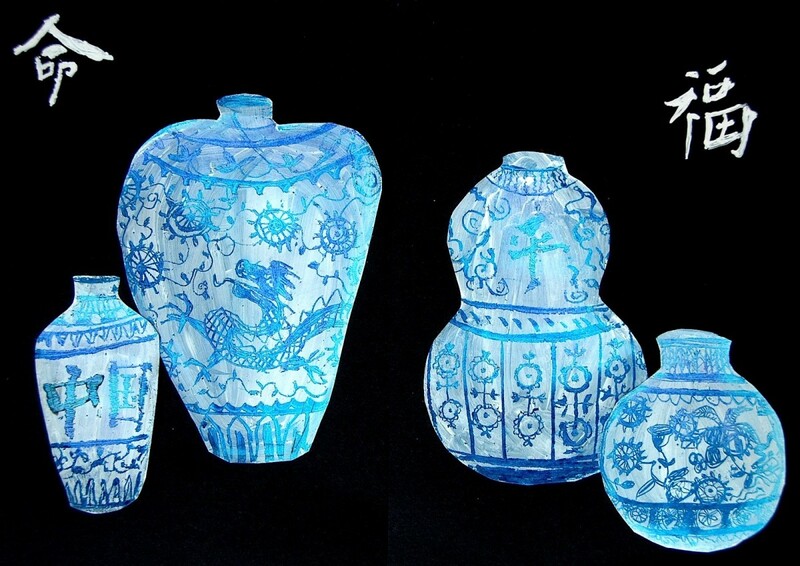 I’ve tried an effective technique to imitate the Ming Vases, the typical Chinese vases in white porcelain with blue decorations. 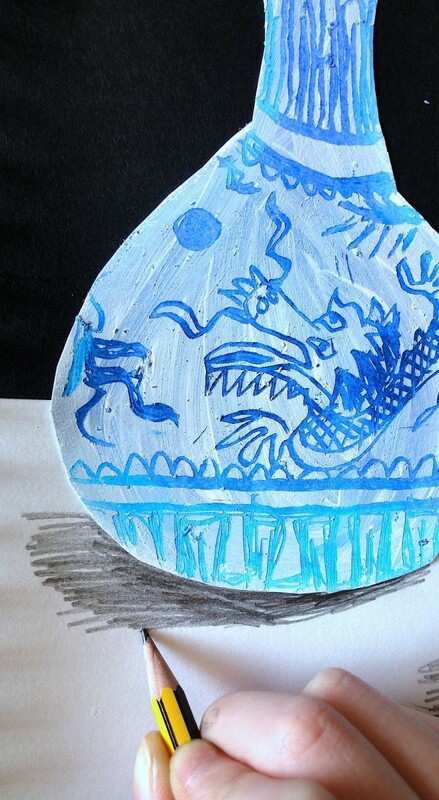 We begin copying the characteristic shapes of the Chinese vases from some pictures, with narrow necks and large bellies. To succeed in draw the symmetrical shape you start by median vertical line, draw a half and then you try to complete the other side, as if in a mirror. 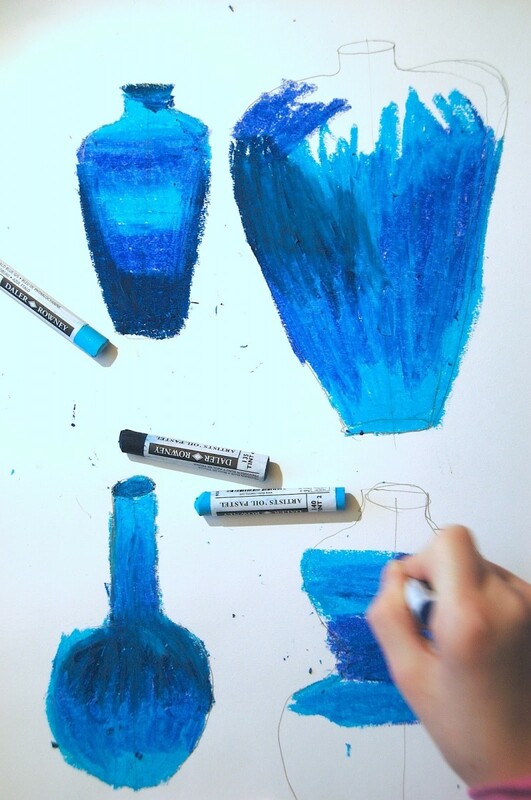 Now you color the shapes with oil pastels in various shades of blue, making sure to fill the whole surface of the vase. 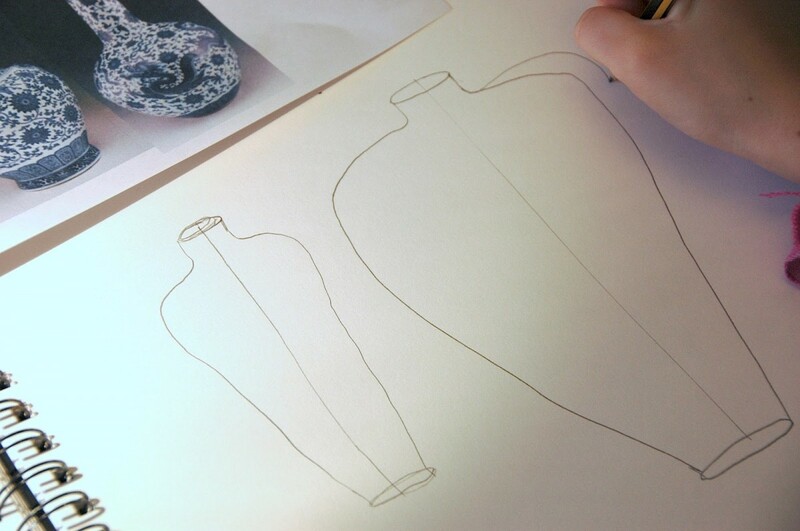 After that you cover the vases with a layer of white acrylic paint or white gesso primer and wait until it dries. 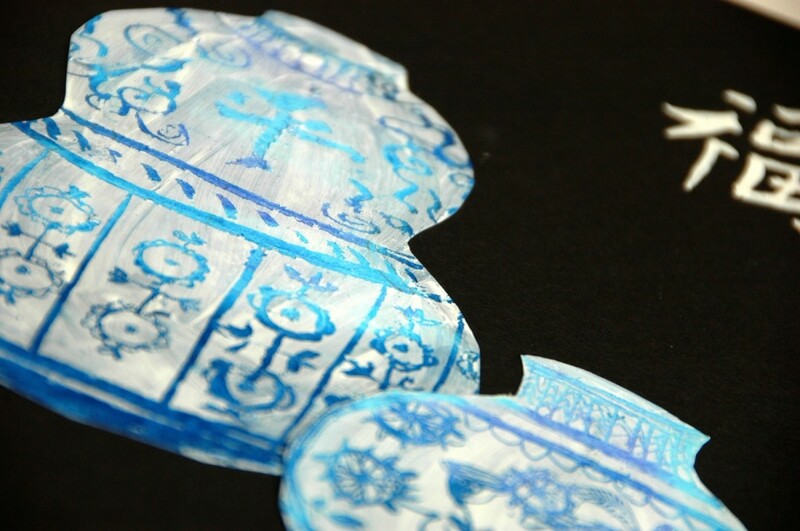 When the white layer is dry you engrave the surface with a toothpick copying the drawings from the Ming porcelains (dragons, ideograms, plants, flowers, clouds and birds…), thus it will appear the underlying blue! 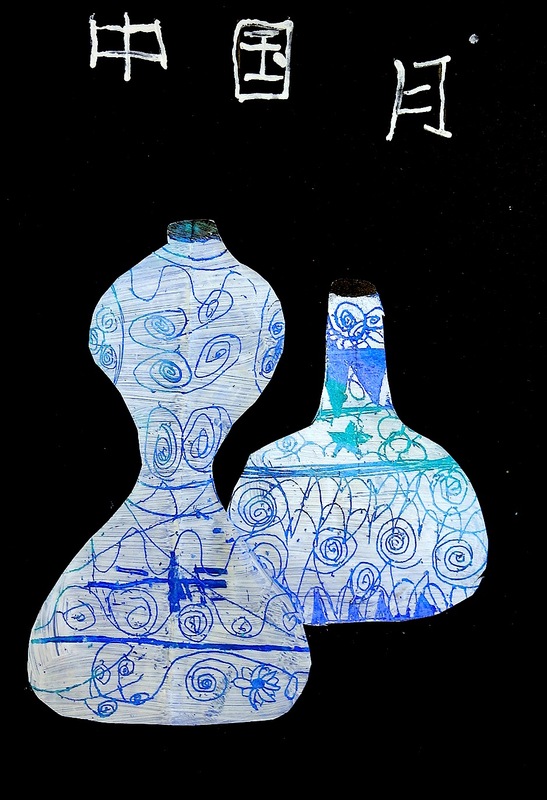 Eventually cut vases and paste them on a black background. 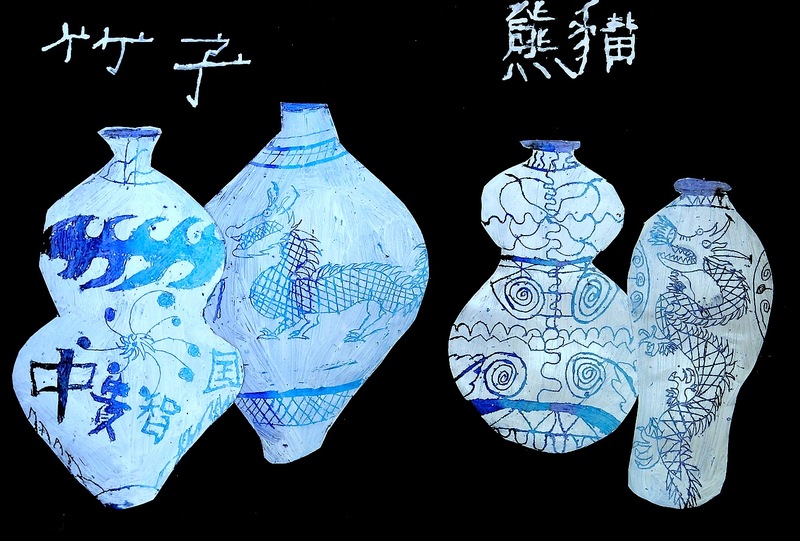 You can paste on a white cardboard adding shadows cast (as you can see in a previous post with the Striped Bottles), or you can complete the composition with white lettering in Chinese! Here below the beautiful vases created by students’ of Cherry Garden Primary School in Bristol. The pupil are in the 6th grade classes. What a great idea! I love the final result, with the various shades coming through. Beautiful! 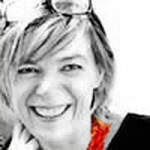 Grazie Silvia! grazie anche del suggerimento del sito, ti seguo in Pinterest e sul tuo Blog! Felice di seguirti e a presto! Thank you for your comment! 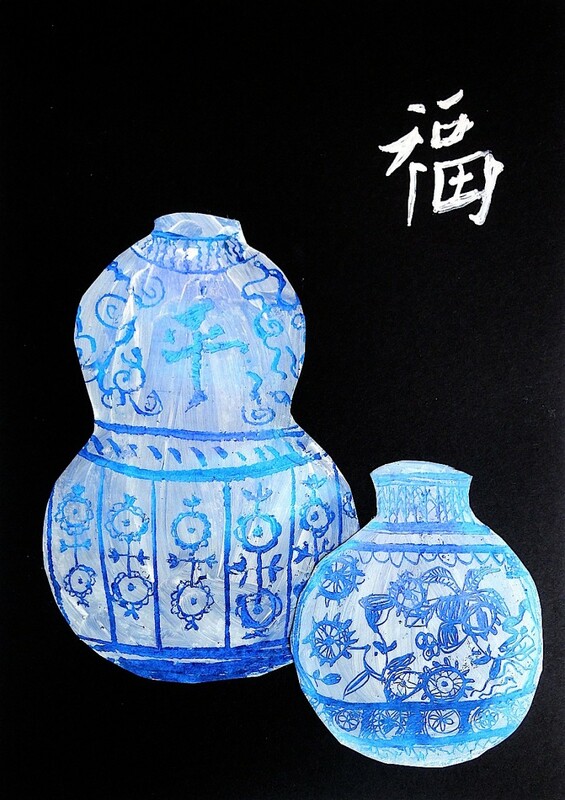 The most interesting effect is the shadow behind the white layer, it seems smooth porcelain! Fantastic! 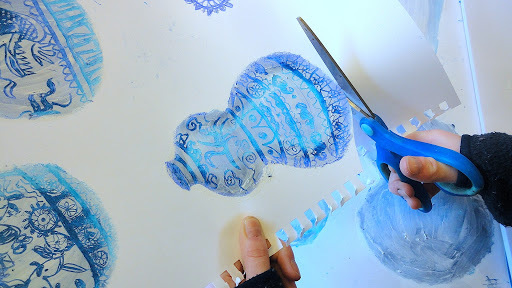 I love the effect of the blue carvings under gesso. Definitely want to try this sometime. Thanks! Wow! What an ingenius technique- love it all and the effect is so realistic! Thanks Mary, and the materials and tools are truly available and cheap! Hi Miss! Thanks for your comment, I appreciate so much! Hi from Africa! This looks so stunning, would love to try it! Hi!!! Where are you writing from?? I lived 2 years in Ethiopia and 2 Years in Tanzania… so i really love Africa!!! send me other details of you and your work!! thanks for your comment! These are just gorgeous! 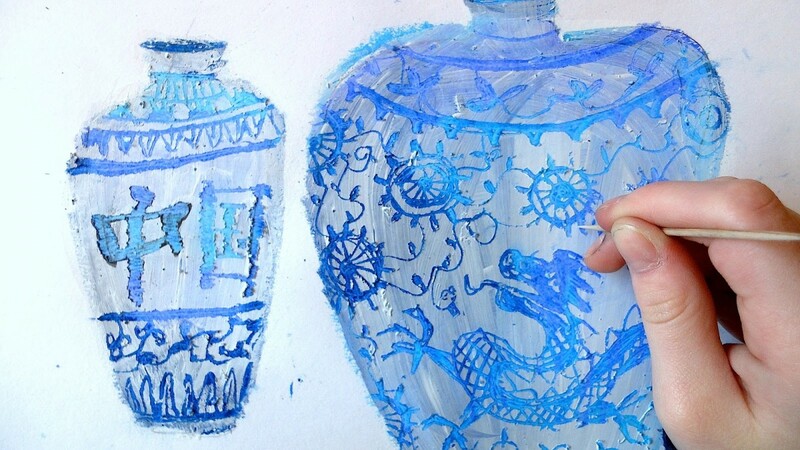 I've done Greek vases the same way with orange covered with black paint, but never thought of this! A whole new world just opened up! Thank you! Even for me was a discovery! My daughter had to create something about China and I thought to these Greek vases… but white on blue!I've and my daughter enjoyed so much to try different kinds of blue and different media for the white layer (acrylic white paint, white tempera, gesso primer…). And when we would engrave it we began to use nails, pins, spikes, blue pencils, scalpels… then I thought about a simple toothpick! WOW! Hi Joe!Did you have a nice Christmas holiday? I hope so!! Thanks for your comment and HAPPY ART! 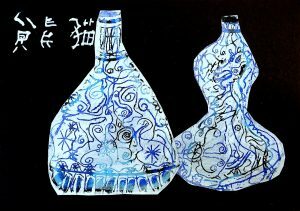 hello there,I am an art teacher from Malaysia and now addicted to you blog!Thank you for sharing. Appreciated! !Have a good day then!! …Non so, non li ho mai fatti, ma se sono venuti questi con pastelli a olio e acrilico bianco dovrebbe funzionare alla stessa maniera con fondo nero e acrilico rosso oppure con fondo rosso e pittura nera sopra. Può essere un'ottima idea comunque. Ho visto fare i vasi greci con pastelli a cera rossi o gialli sul fondo e china nera sopra, anche questo dovrebbe funzionare… vedi un po' che materiali hai a scuola! Martedì vado alla scuola di Laura e Davide a fare una lezione su questi vasi cinesi nella classe dei più grandi e comincio una collaborazione con la scuola per lavorare nelle classi… ti saprò dire come va! Un abbraccio! Hi! Nice to meet you! I'm very happy to have contact with you! 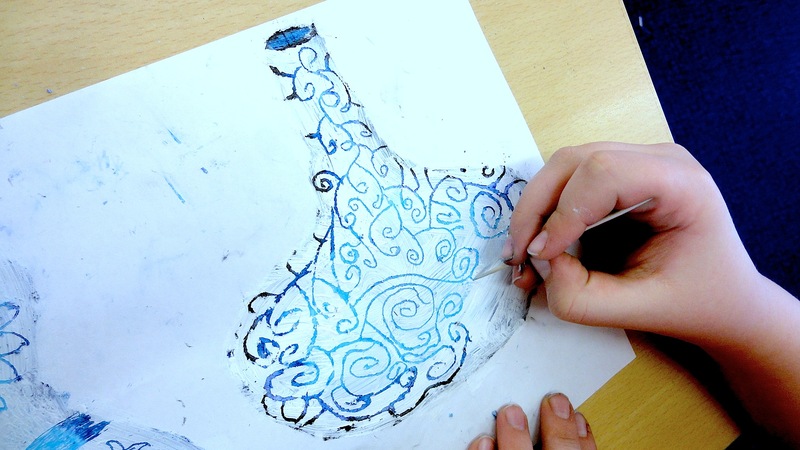 I'm really interesting in the Art teacher works around the world! keep in touch! Hi Louise! I’m very glad to know you!! I was teaching in Italian language (in Italy), but now I live in Bristol and I started to do some works at school with my (bad) English… What are you teaching in Italy!? Where are you living?… Sorry, but I’m very curious to know you!! !I visited your blog… it’s amazing!!! I’ll follow you! Keep in touch! These are fantastic! I love the addition of the shadows for the realistic effect!!! Thank you Mrs.Chance (is your name Molly?! 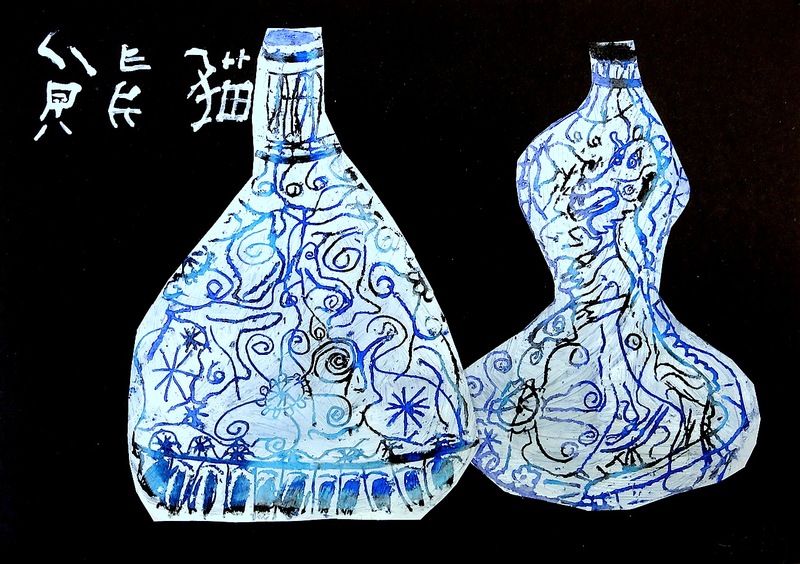 )I visited your blog and I started to follow your works! Thanks for your comment, I very happy to know other teachers!Keep in touch! Thanks for the recent comment on my blog. You have wonderful projects here as well. I think I might try this one during the spring. Keep up the great work! Great! 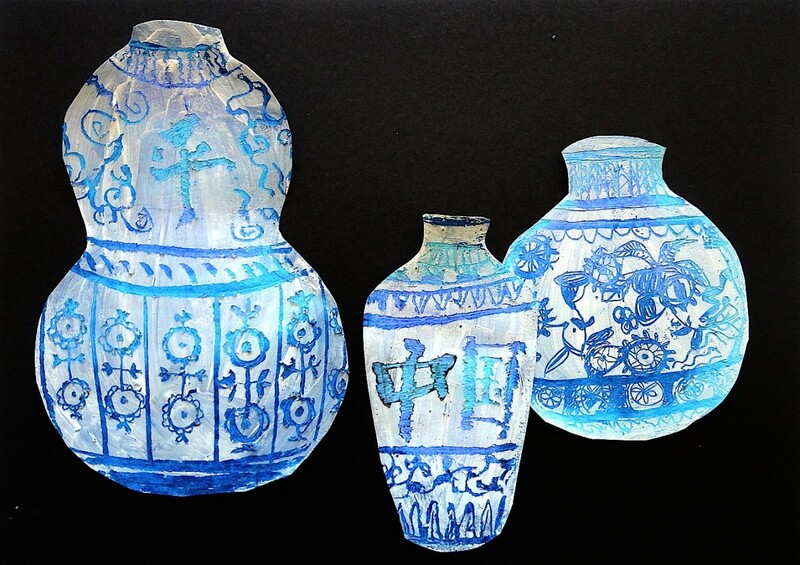 This spring I'll see your work about Ming vases… wow! This is lovely. 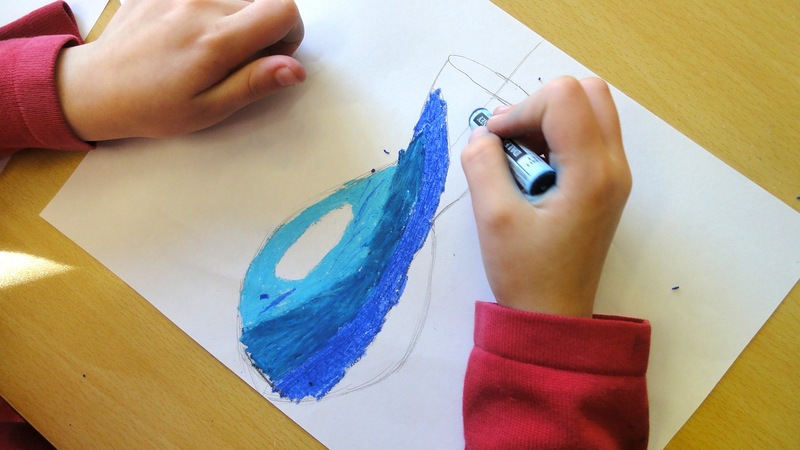 My students love to remove the top surface but we have always used black. 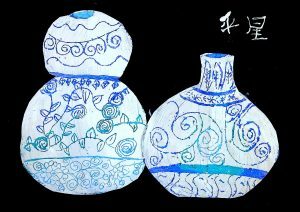 This is another great technique and they will learn about Ming vases. Thanks so much I will post some photos for you when we complete. You are generous for sharing your ideas and time. Love your idea and trying project now with my 6th graders. We are having a problem with the gesso peeling off in unwanted areas when they use the toothpick to scrape the design. They are unable to carve out lines/design details. Any solutions???? These are beautiful and you're right the materials are so readily available. 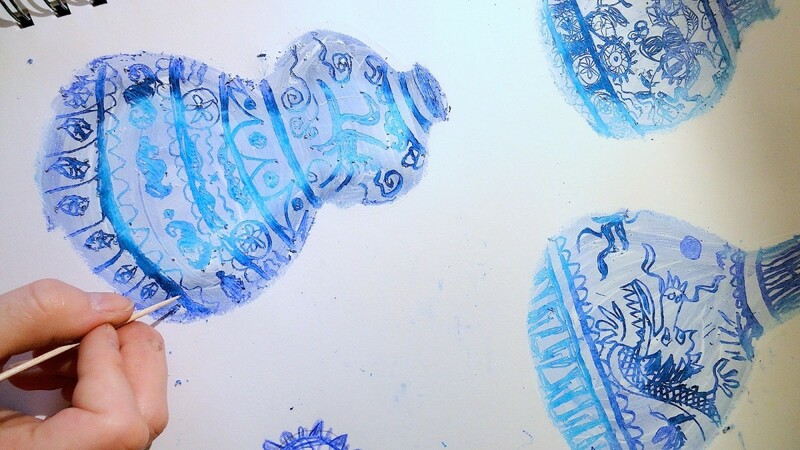 This idea would also work with Delft pottery. 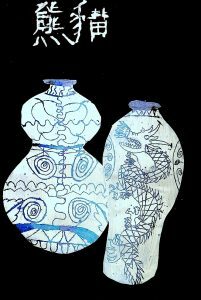 I love this idea and am using with 8th grade students, although we are also adding collage to make this a mixed-media assignment. 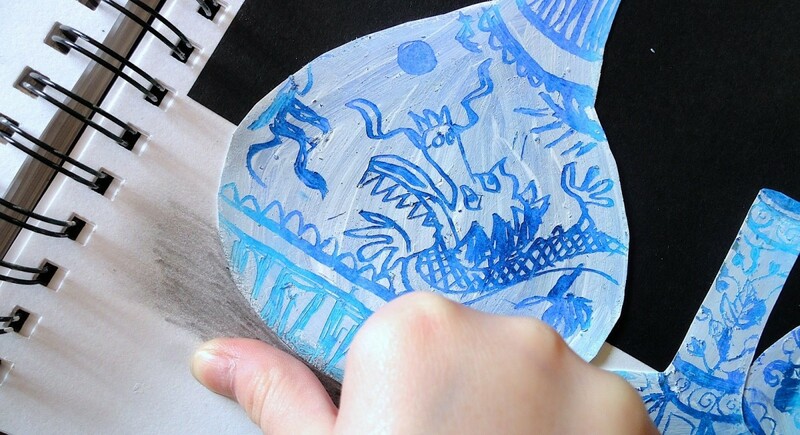 Has anyone done this with Greek pottery, as that would probably also look really nice. I will offer that as an option in case some boys want to do that.Thanks again for sharing this wonderful lesson idea! I'm so impressed that you were able to get such great results with 6th graders! Wow. 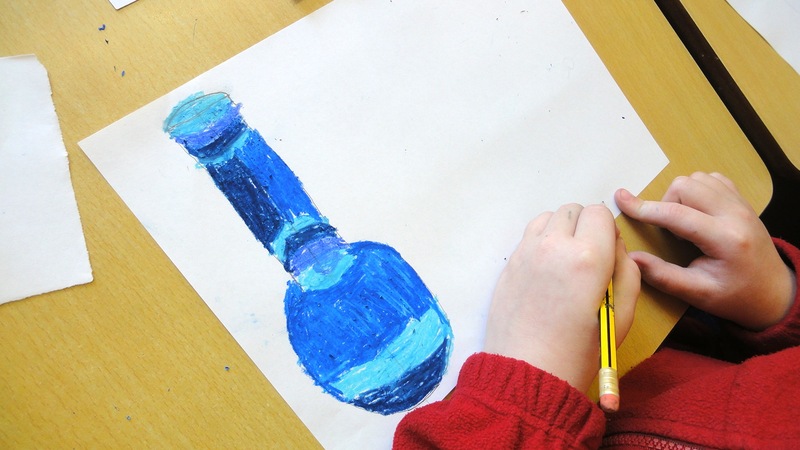 Thank you for sharing this wonderful lesson idea! 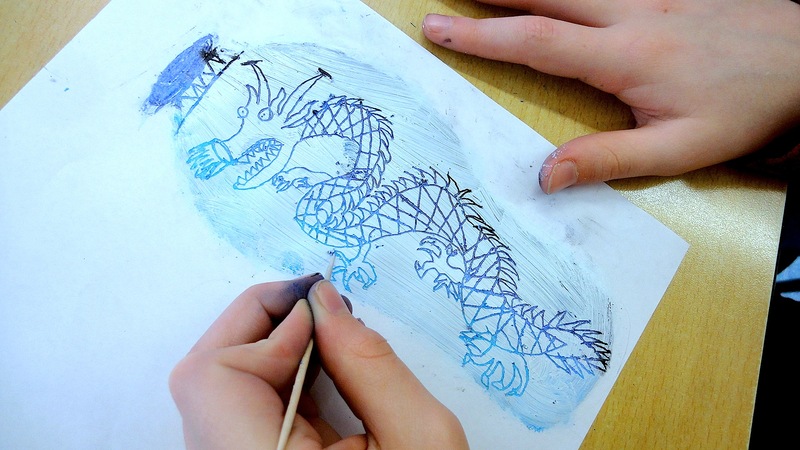 I am so impressed with the quality results you achieved with 6th graders. 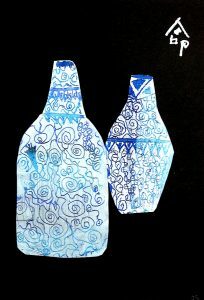 I'm going to try it with 8th grade and also require them to use collage as well to make a mixed-media project. 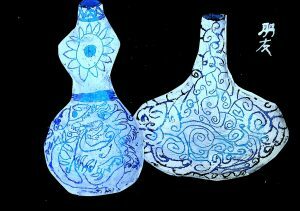 Has anyone tried this with Greek pottery? I may offer that as an option in case any boys would prefer that using red oil pastels under black paint.I did also have some trouble with the white acrylic flaking off in areas I didn't want it to. My best results came from using Scratch board tools to first incise the lines and then use pointed wood scratch art tool to lift out larger shapes and lines.Hope my students like this!! 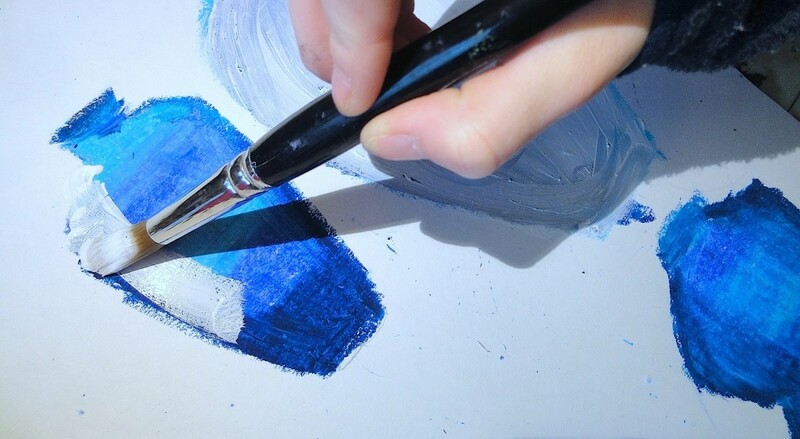 Do you have them scrape away the Black acrylic over layers of white oil pastels? 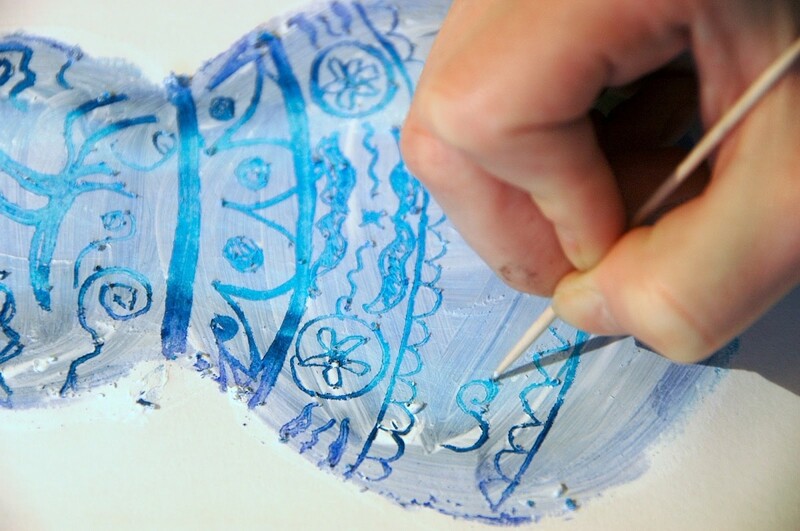 Try adding a small amount of liquid dishwashing soap to acrylic craft paint for the top layer. I don’t know why it works, but it helps the paint stay where you want it and also makes it easier to scratch off. It worked well with black acrylic paint when my students did a Paul Klee “Fish Magic” project using the same technique. 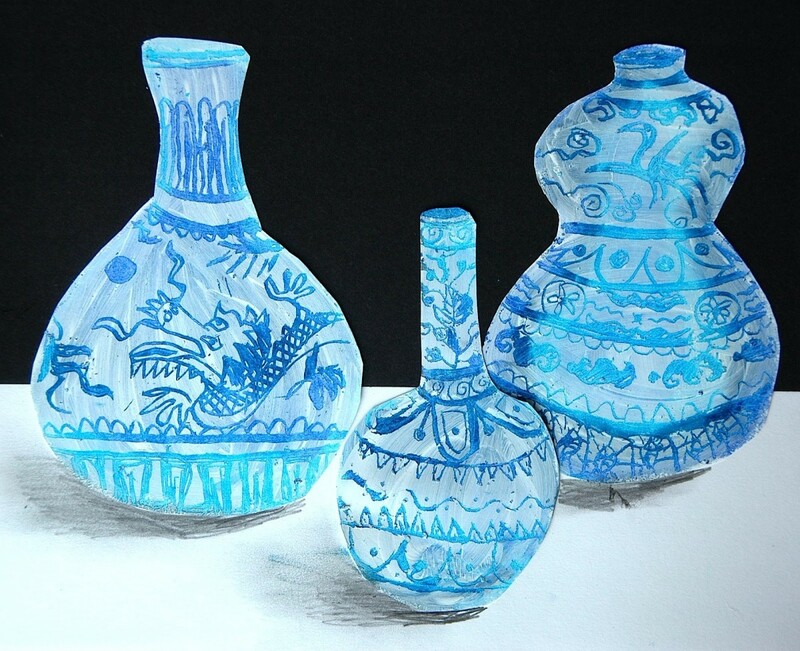 Now we will try it with white acrylic paint for Ming Vases. Miriam, i love the look of your student’s vases…great project! Thanks for sharing! These are so beautiful. I’m going to try them with 5th and 6th graders this year. Thank you for sharing! Thanks for your comment Malu! You’ll enjoy this simple and effective technique! 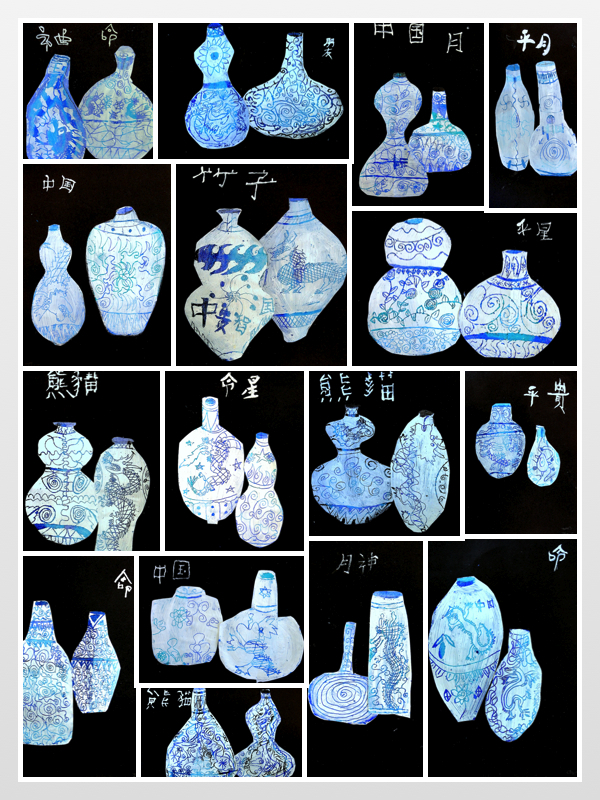 What a beautiful art project! 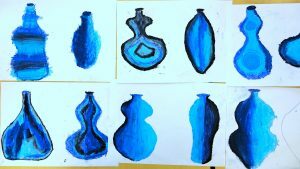 I have just completed it with my grade 6 students. They enjoyed themselves and the results are lovely. 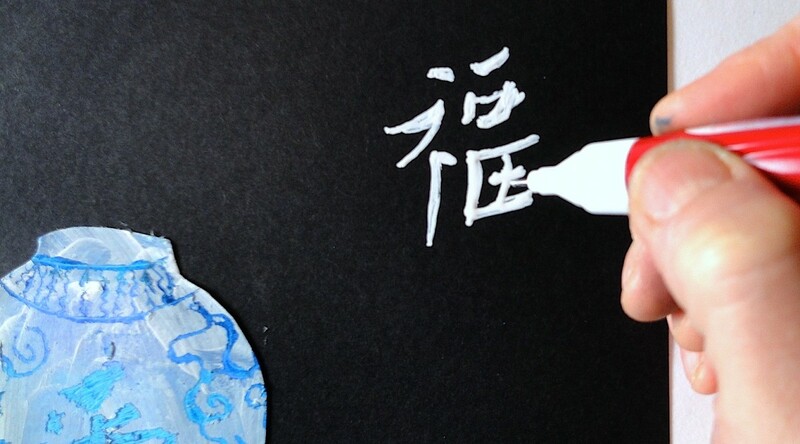 Just a question … what do the Chinese characters mean that you added onto your final page? Love this idea! Thank you for sharing. Hello from sunny California! I have tried this project and it turned out beautifully. For those of you who are having trouble with the flaking and the white coming off in unwanted areas, try adding a little dish soap as Julie in 2014 (above) suggested. I found that helped make it easier to etch with the toothpick. The final project is just beautiful! I’m going to try this technique with some Chinese style waterbirds. 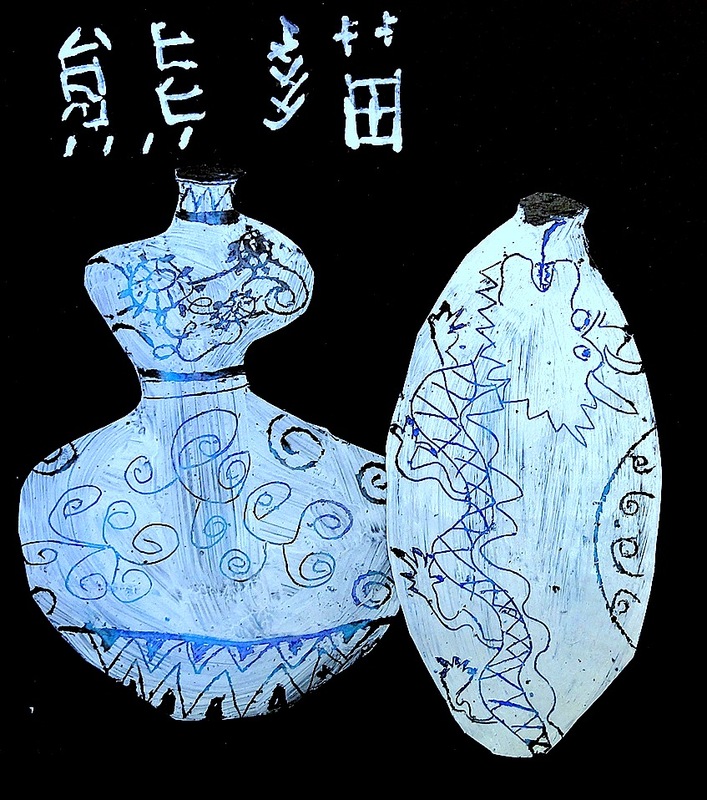 what do the chinese symbols say? or how did students know what to write? Hi there! I am in my 3rd year of teaching and I am gong to try this with 5th grade. I may have to give them some extra support for the vases. We will talk about symmetry, fold the paper and then draw and cut away from the fold to create symmetrical vases. My group of kids are somewhat low so we are inching into drawing independently without freaking out. LOL However, I know they will love the painting process. I prepped paper today to try it tomorrow with oil pastels and tempera paint. I pray it works because I love it. Can’t give this group acrylic; it a challenging group of students so not yet. thank you so much for your blog. I am learning a lot from you. I did this with my world history class, but we are having trouble etching into the acrylic paint. They keep ripping the paper. Any suggestions? 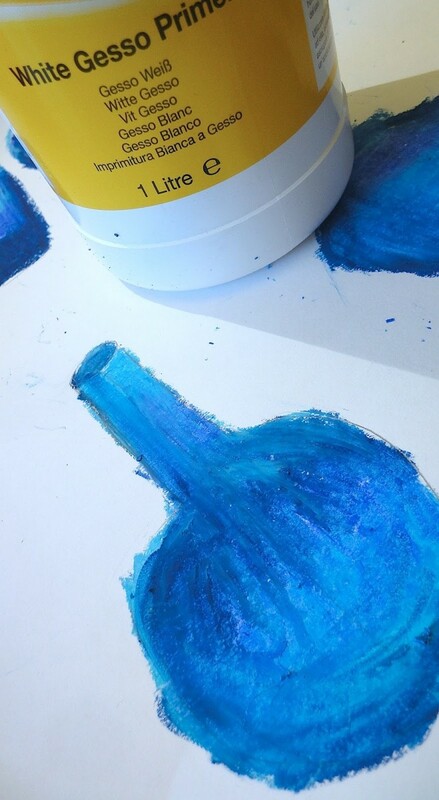 I used tempera mixed with a little dish soap and it worked awesome!!! Thanks so much for the great idea! !